Katie Derham presents a lively mix of conversation, arts news and live music. Her guests include conductor Ben Gernon, singer Ana Silvera and Eblana String Trio. Katie Derham presents a lively mix of conversation, arts news and live music. 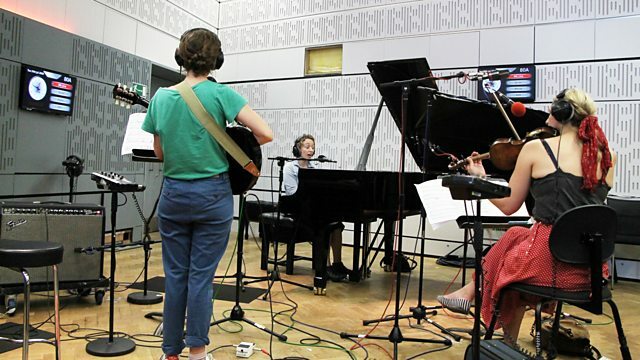 Her guests include Ben Gernon, who'll be conducting the BBC Philharmonic at the BBC Proms later this week, singer Ana Silvera, who sings some tracks from her new album live for us and City Music Foundation Artists Eblana String Trio, who perform in the studio ahead of their appearance at Lake District Summer Festival next week. Performer: Ana Silvera. Performer: Josephine Stephenson. Conductor: Claudio Abbado. Orchestra: Mahler Chamber Orchestra. Mozart: Die Zauberflote: Mahler Chamber Orchestra, Abbado. Performer: Robert Jordan. Orchestra: Scottish Chamber Orchestra. Conductor: Ben Gernon. Peter Maxwell Davies - An Orkney Wedding With Sunrise and other works. Orchestra: Freiburg Baroque Orchestra. Conductor: Pablo Heras‐Casado. Schubert: Symphonies Nos. 3 and 4. Conductor: Christoph von Dohnányi. Orchestra: Cleveland Orchestra. Choir: Cleveland Chorus. B. Smetana; Moldau/The Bartered Bride: The Cleveland Orchestra/Dohnanyi. Performer: Enrico Onofri. Performer: Giovanni Antonini. Performer: Michele Barchi. Ensemble: Il Giardino Armonico. Conductor: Giovanni Antonini. Singer: Dawn Upshaw. Conductor: Kent Nagano. Orchestra: Orchestre de l’Opéra de Lyon. Marches & Overtures a la Francaise: Paray.